“Worlds Apart” is the culmination of a major project showcasing senior level students of the Dark Peak Music Foundation and Peak District Music Centres, including national award winning ensembles Dark Peak Concert Band and Peak District String Orchestra. The concert also features the “Orchestra of the Peaks”, a full symphony orchestra drawn together especially for this concert from talented young musicians from across the area. With over 100 young musicians involved, the programme opens with John Williams’ “Olympic Fanfare and Theme” from the 1984 Olympics. Other blockbuster scores include Star Wars (the Force Awakens) and highlights from Jurassic Park. Together with the great orchestral tone poem “Finlandia” by Sibelius and Ellerby’s charming musical evocation of the “Tales from Anderson”, it promises a varied and exciting evening, climaxing with a rousing performance of hits from “Grease”. 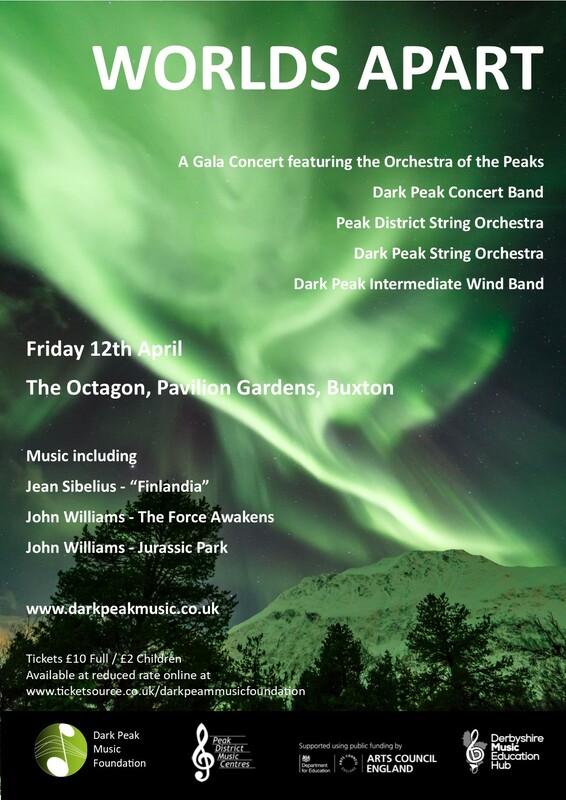 The Concert is at the Octagon in Buxton on Friday 12th April, 7.30pm. Tickets are available at discounted rate online at www.ticketsource.co.uk/darkpeakmusicfoundation.